It has definitely been a few extra stressful weeks, and not at all the relaxation we had so desperately hoped for and needed in June. But, like it or not time marches on, and here we are in the middle of Labor Day weekend. When we started the summer my daughter had 2 basic requests. And then we looked at the calendar about to change to September and realized between appointments, procedures, tests and surgery – we never got either one done. 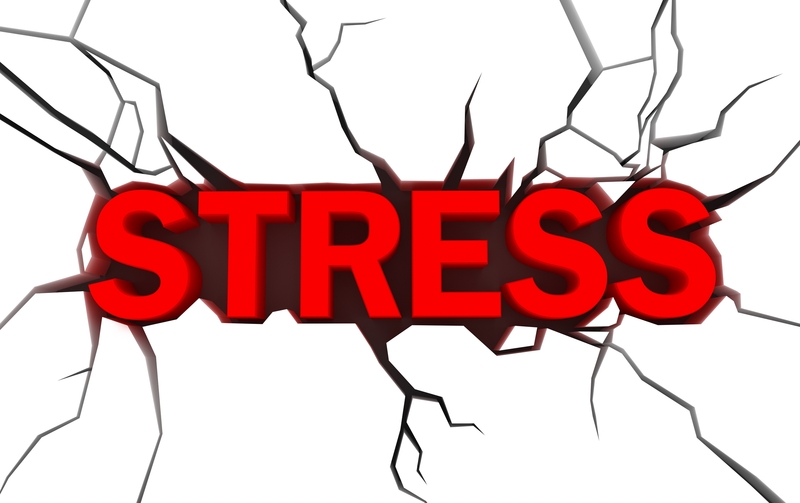 Stress is very individual in how it affects each of us. We all have stress. We all deal with it differently. But I think that the reality that stress can, and does manifest in real physical illness is often lost on us. Especially lost is the harsh reality that stress can make our CHILDREN sick – until it smacks you in the face. It became clear this week that the stress is weighing heavily on Meghan. She is one tough chick, but there is only so much the mind and body of a really cute, smart, well behaved 10-year-old should have to endure. It is now the top priority of her father and I to actively work on lowering her stress level. 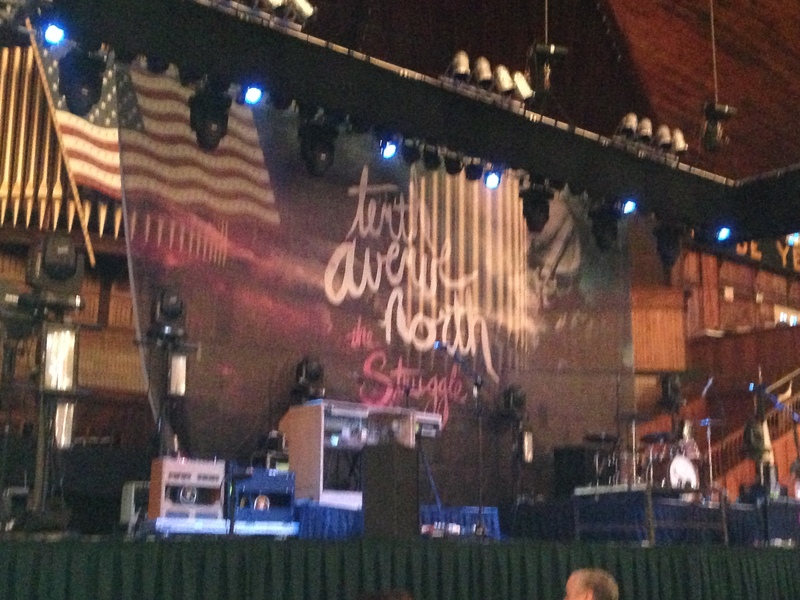 Months ago we purchased tickets to see the Contemporary Christian band, “Tenth Avenue North” in concert in Ocean Grove New Jersey on August 31st. We decided to make a day out of it – or a half day at least! We let Meghan sleep as late as her body needed. (Falling asleep has become terribly hard again.) Then she got to watch some TV. I ran a few errands, and around 3 with a cooler full of cold cuts for “dinner” we set out to surprise her with a trip to the beach. We never told Meghan our plan, although it was obvious she was secretly hoping for the beach. We just know too many factors can get in the way on a moment’s notice. So, it wasn’t until we were looking for parking that we even told her. By then it was 4:15. The perfect time to take a kid who is not really sure she likes the beach, to the beach. Crowds were waning, and as we set up our blanket she had some time to adjust to the seagulls, and the sand between her toes. Forever my texture phobic kid, truth be told the sand in the toes was the reason I stopped really bringing her to the beach years ago. 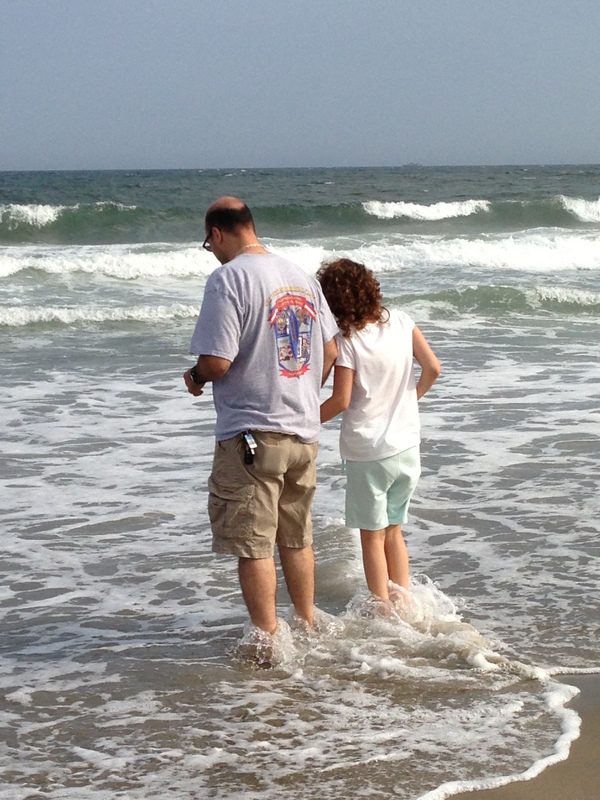 But today there was a mission to put her toes in the water and collect shells with Mom and Dad. She walked with Mom. Then she walked with Dad. 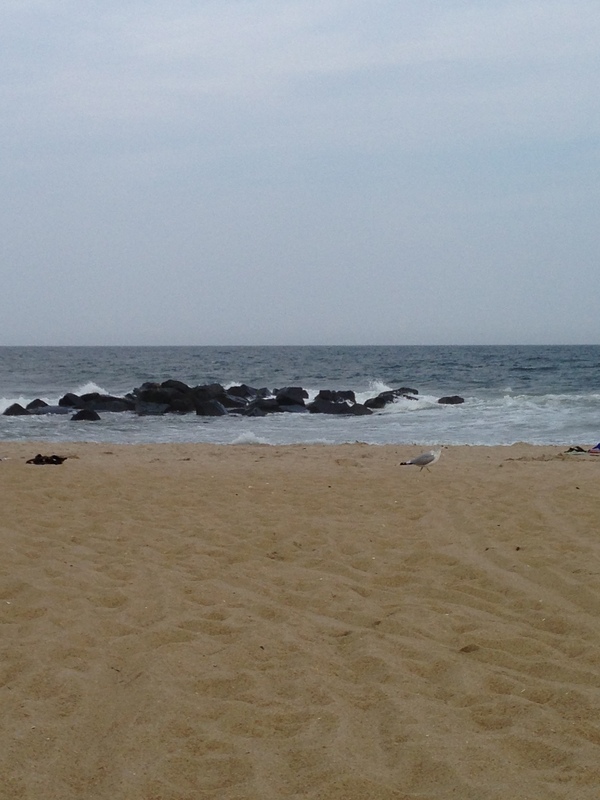 And for a few glorious minutes I laid my head on the towel and remembered my childhood days in Ocean City,NJ. 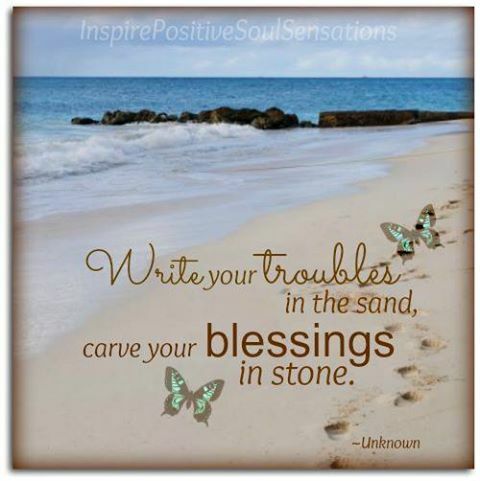 I listened to the waves, felt the sand between my toes, and felt such PEACE! We have a small bag with some beautiful shells. We even played some with her Nerf frisbee. There was laughing, and smiling, and a good deal of stating and restating that the sand on her toes does NOT feel nice. With some gentle prodding she came around, but was perfectly happy with 2 cool hours on the beach. So glad I didn’t get a full day plan in place! What we did NOT do was have a picnic lunch on the beach as planned. Instead, we ate in the car. Sea gulls, being nothing more than glorified pigeons would have undoubtedly created significant reflux for my girl. So, we had Board Head chicken breast in the car, with potato chips, and had a great conversation – minus the sea gulls. And somehow I knew we had done things right – today. We headed over to the Great Auditorium for the concert. We happily bought our girl her first concert T-shirt, and her “Tenth Avenue North” Bracelet. In-scripted inside the bracelet are words from the cover song off their newest CD, “The Struggle.” It reads, “We are free to struggle, but we’re not struggling to be free.” She is sleeping with it on right now. The show was amazing. Meghan was enthralled. They are quite the performers. The lead singer also spent some time talking to the audience about God’s plans. He told the story of a car accident his Senior year of High School where everyone thought he would die, and no one thought he would recover fully. That 32-year-old man with a wife and 2 daughters spoke definitively tonight about believing God will use the adversity to grow greater things. He told us he touched a guitar for the first time at 18 while he was waiting to heal from his accident. Clearly, God had a plan. I was touched by the story, but more moved by Meghan’s reaction. She HUNG on his every word. She was thinking – deeply. Then she asked if I had any of the “Cowden’s cards.” And, God bless this girl she walked right up to the stage and handed them to one of the back up band members… alone. You know the irony with this darned Cowden’s syndrome is that what you NEED is to be away from doctors, because they cause STRESS which prompts other conditions that cause you to NEED doctors. So, a few days after the hand became free, we are on the hunt for the solution to more developing problems. Stress. We do what we can to deal. We use music. We enjoy time together. We try harder to get it right. We hug each other. We hold each other. 1). I heart your toes! 2). 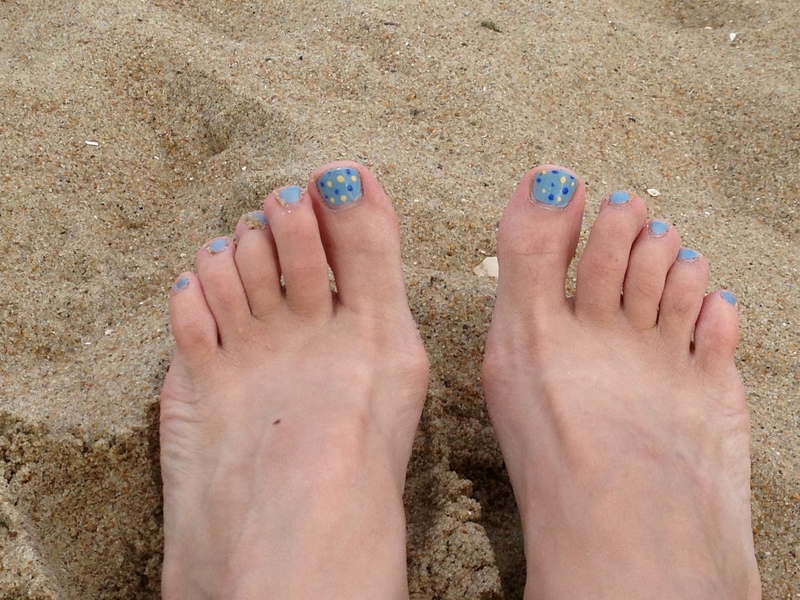 I heart the pics of the beach! 3). Man. 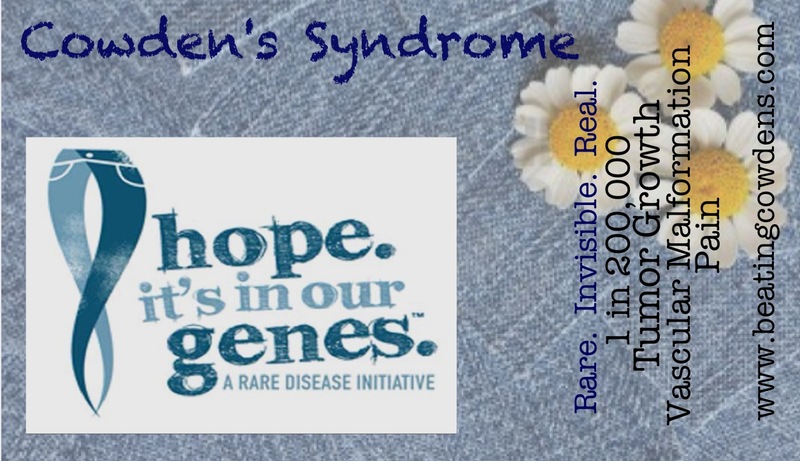 Every time I write about my struggles/fears/anxiety about Cowden’s Syndrome….I come to your blog and I read about you and your daughter. And I am humbled. I want to be the ambassador as she is. Please tell her that from another person with CS – she gives me the strength to move forward.